Govt Staff Nurse Jobs in Central Institute Of Psychiatry. Scale Of Pay : 9300 - 34,800. Relaxable for govt employees 5 years. Web site : Click Here. Detailed Notification : Click Here. Application Form : Click Here. Indiane Inistitute of Technology, Roorke. Muncipal Corporation, west begnal, Kolkatta. King George's Medical University, Lucknow, UP. Indira Gandhi Inistitute Of Child Health, Karnataka. National Institute of Mental Health & Neuro Science. 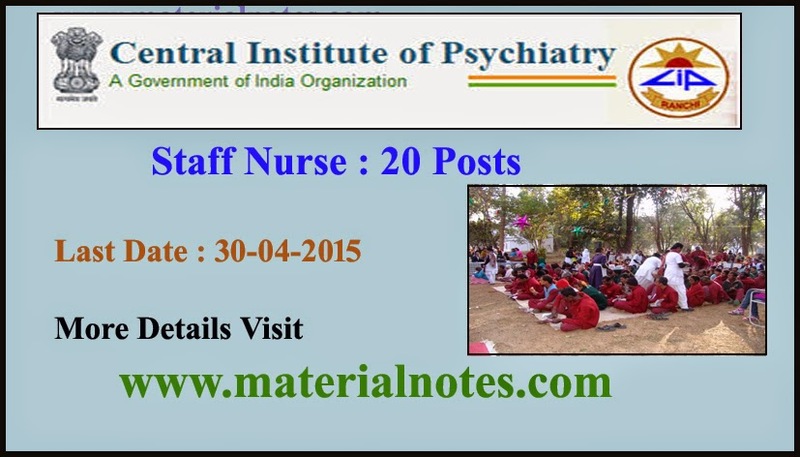 Staff Nurse Jobs In Central Institute Of Psychiatry.